Superintendent Dr. David Leach, Director of Human Resources Mrs. Cindy Leandro, Director of Transportation Ms. Debra Weissman, Assistant Superintendent for Business Mr. Timothy Holmes, and members of the Transportation Department stand next to one of the District’s new propane buses, and in front of the new propane filling station at the bus garage. 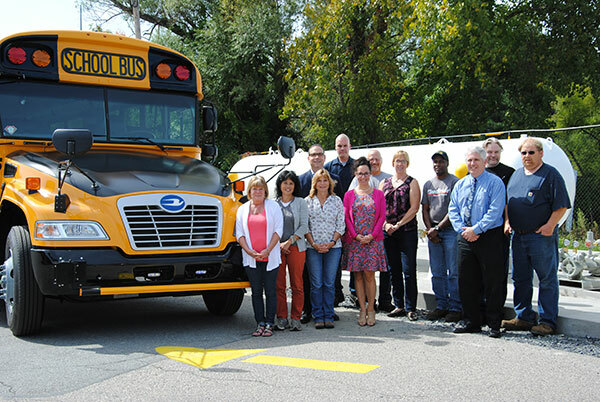 Warwick Valley Central School District has received delivery on five new propane buses, which will begin rolling out on local roads shortly. The purchase of propane buses was approved by voters last May. 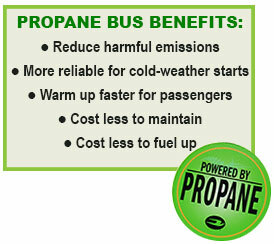 The propane buses are more efficient than diesel-fueled buses, and will reduce the District’s carbon footprint since propane burns much cleaner than diesel, with almost zero emissions. A new propane filling station has also been installed at the bus garage. The District will receive a federal tax credit for the purchase of propane, and expects to spend about 50 percent less per gallon for propane than for diesel. Propane buses are less expensive to maintain as well – typically routine maintenance costs for propane buses are 30 percent less than diesel buses.